Choose your own mystery game. How To Be Truly New & Uniquely You. By Natalie Buske Thomas. You’re an indie, right? So are you blazing your own trail or simply following the herd, hoping for a break-through? I don’t hold out much hope for a break-through. I’m not one to buy lottery tickets. I don’t waste my time learning how to game the system or master the latest sure way to get more likes. For me, the best chance of success is to fully embrace what it means to be an indie: I’m not just an author, I’m an entrepreneur! Entrepreneurs, I think, are naturally suspicious of anything that works well for everyone else. Which is why I’m not a blogger. I tried it, but I couldn’t stick with it and my contributions were largely uninspired. I have five followers despite much promotion. Besides, everyone else had already established their blogs and I came late to the party. Once something is on the to-do list for how to succeed, it’s too late. The trail-blazer has already done it, as well as all of the early risk-takers who knew who to follow. By the time the advice becomes commonplace it is too common to be considered innovative. Blogging is not innovative, not anymore. Blog radio is a newer venue, and I’ve added my own radio show to the growing number of radio shows on the Internet. But doing the same thing in a slightly different way is not what I mean by innovative. Innovation is about doing something that is truly new, and uniquely you. To start, get to know your target market, don’t try to be like everyone else, think outside of the box, go with your mojo, etc. (add your own marketing advice cliche). If you are having a promotional identity crisis, I encourage you to go back to Marketing 101 and define your target market. Take a few business courses if you aren’t sure of yourself. But basically, the heart of marketing can be summed up with one question: Why do your fans like you? Learn what they like and give them what they want. My target market likes my energy, humor, and creative mind. I know this because I listen to feedback and reviews. I also pay attention to which of my social media posts get the most likes and which of my tweets get re-tweeted. My fan base isn’t interested in my attempts to write articles about publishing (crickets!) or my musings about life in general. They don’t care about my side projects either (non-fiction books). These missteps are not a problem. As an entrepreneur I can re-invent my marketing plan at any time. I knew that I had to tap into what my target market wants from me, so paying attention to what they responded to was crucial. I learned that my fan base likes it when I am lively, fun, and interactive. Always keep in mind: If you aren’t giving your readers what they want, you are unlikely to attract the kind of readers who will like your work. You’ll know when you’ve hit upon something they like – they will respond. However, games are not new. Interactive stories are not a new concept either. The combination of these two makes the idea more unique. Bringing this project to a free space on my own web site? Now we’re getting innovative. Tying it into my series? That’s where it becomes uniquely mine! Take a big idea and personalize it. Make it smaller and smaller until it is uniquely your idea. I also host contests. Big deal, everyone is doing these, right? Not like this! My contests are innovative because they are uniquely mine. My current contest is called “Who’s Gonna Die?”. 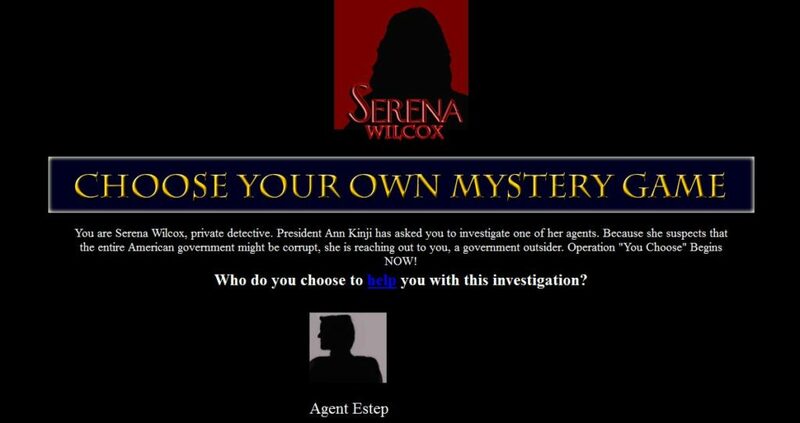 The Serena Wilcox Mystery character receiving the most reader votes receives immunity from getting bumped off in the next novel. What gives this contest an added twist is that several of the characters were named after, or inspired by, readers. These readers want immunity for “their” character and have been campaigning to get their family and friends to vote for them. The element of fun is high because the contest is personal. I’m not giving away Kindles or other products unrelated to my series. I’m also not giving away copies of my books — my readers already have my books. I’m giving away something that encourages readers to invest in my series: I invite my readers to become part of my series. One last area I’d like to mention is tying your other talents and interests (not related to writing) into your marketing efforts. Already been done? Well, yes, but not like this. I don’t mean professional tie-ins, like retired law enforcement who write thrillers. I don’t mean hobbies like crafts or genealogy either. Those are things that one can pick up a textbook or how-to book for. What I’m getting at is something far more personal, something of yourself that you can share with your readers. Maybe your “something of yourself” is your law enforcement career, or a hobby like craft making or genealogy. What matters is that you connect these things as tightly as you can to yourself and your books. Make sure that you aren’t so busy informing your readers about your credentials that you forget to put enough of yourself into your tie-in. The more of yourself you can add to your work, the more memorable you will be. I am a mystery writer in an ocean of mystery writers. My recent books cross over into the thriller genre – the ocean is now a Great Lake. My books also include a bit of sci-fi, futuristic and dystopian literature. Ah, I may have hit river size now. But, you see that I’m still swimming in a very large body of water. I need to dig deeper, beyond what I write. There are many authors in my genre, but there is only one author of mystery, thriller, sci-fi, dystopian novels who is also an oil painter, singer, drummer, and tap dancer. That one author who is all of these things is Natalie Buske Thomas. I am one of a kind! Some side jobs lend themselves well to the creation of the books themselves. I recently realized that I should be painting the book covers for my books! I video taped my progress from blank canvas to finished project. My readers watched the painting for Covert Coffee develop. The entire project was interactive, exciting, and another opportunity for readers to get to know me. I tie my other talents and interests into my books by including them in the series. Then, I share the personal inspiration back-story with my readers. Videos of my family band, my tap dancing, and my singing are on my website: www.nataliebuskethomas.com/videos.html. My (beyond book covers) oil paintings are in public galleries and also online: www.nataliebuskethomas.com/paintings.html. I relate everything together in one big ball of “me” when I do any public speaking events and I present myself this way in biographies, social media profiles, etc. Beyond marketing yourself and your book, it should go without saying that you must first have a well-written and well-packaged book. However, if you’ve already launched your writing career and you are wondering why you haven’t yet reached your goals, maybe you need to re-frame your perception of what it means to be an independent author. As an indie, you are not just an author, you are an entrepreneur. Take a big idea and make it smaller; more and more personal until it becomes truly new, uniquely you. Not only will you be an innovative promoter, but you’ll be much happier too! Isn’t that why you became an indie in the first place, to do what you love? What an insightful, practical article. My mind is humming with new ideas now. Thanks so much for sharing! All the best. Thanks for the insights, Karen. I agree with your assessment that by the time a writer hears about the next great promotion idea, the bandwagon will be full. A2R marketing, or Author to Reader marketing is all about outreach and engagement. I write about writing from a business development viewpoint using my experience in the trenches of startups, sales and marketing. I love the creativity of marketing almost as much as I love writing fictional thrillers. You’ve reassured me that this is the right kind of thing to do. I’ve tended to keep my different areas separate up to now (artist, philosopher, meditator and clown), but I’m planning to bring them all together on my Happy Honkers blog. My present author blog will become more and more a review site. I really resonated to this encouragement not to follow the herd…which has been both exhausting and unproductive for me. Although I am very different, the thinking behind this approach is, I would say, universally applicable. We are all so used to living with ourselves that we fail to see our uniqueness, and really connect that to the book in question. And every book is the compilation of the author’s uniqueness! So thank you for a very valuable reminder.